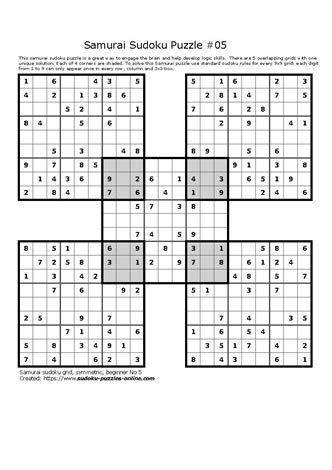 Challenge your Sudoku skills with the Samurai Sudoku interlaced 5-grid format. Each of 4 9x9 grids are connected to a center Sudoku at the four corners of the center grid. To solve this brain teaser use basic rules of Sudoku where the digits 1-9 occur only once in each column, each row and within each of the forty-one 3x3 grids. This puzzle is rated beginner, or easy. It engages the brain, activates logic problem solving skills to arrive at one unique solution.